Requests for private commissions vary a great deal. Some clients prefer to leave the subject matter entirely to me and others are fairly specific in their desires. Whenever I feel there is a certain vagueness in their requests I volunteer to submit two sketches for their approval. If neither is satisfactory the client may cancel the commission with no charges. If you have questions call 952-926-1547 or email. 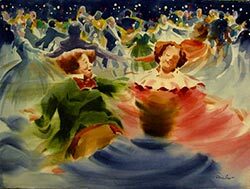 The marketing department of the nationally known Guthrie Theater in Minneapolis commissioned me to create a series of paintings of the theater's holiday tradition, A Christmas Carol. This was done in conjunction of the 30th anniversary of the Guthrie putting on the much-loved Dickens story in 2004. I created 14 paintings from various productions throughout the 30-year run. The Guthrie put one painting on the cover of their program and created posters and holiday cards from the paintings, which were then sold in their gift shop. The Guthrie plans to display the paintings each year when the play is performed. 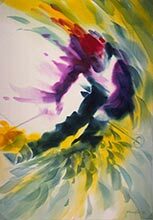 This commission was obtained through an art consultant in West Palm Beach, Florida. It consisted of seven paintings all done to a specific size-34 x 24 to be framed and hung in the cruise ship "Enchantment of the Seas". The instructions given were fairly straight forward - sports of all kinds, executed in various degree of movement. The consultant and I had discussions at length touching upon the kind of sports to be depicted. We then agreed on the subjects and a date of delivery. This one was obtained through the same consultant for the Royal Caribbean commission. 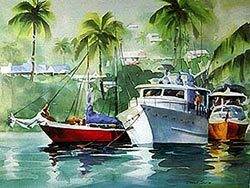 Since the instruction was very general - boats, water and scenes indigenous to Florida and the Caribbean, I suggested submitting preliminary thumbnail sketches before going on to finish. The arrangement worked out well. 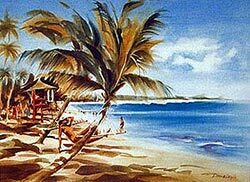 A gallery owner put me in touch with the Carlson Travel group to do a painting of the Bahamas commissioned by US WEST to reward its outstanding employees. The employees were treated to a 3 day cruise in the Bahamas; at the end of the trip each employee was given a framed print of my painting. I accompanied a small group which scouted all the destinations of the cruise. That gave me an opportunity to sketch and photograph. I later submitted a group of thumbnail sketches from which one was selected. I did another commission for the same group two years later for another destination. 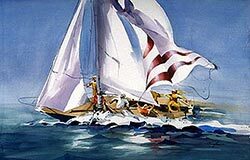 The Los Angeles office of Goldman Sachs requested a large sailing painting from my art consultant. A sketch from my portfolio was presented along with samples from others artists. Mine was chosen and I rendered the scene based on the sketch.